As Romance Week continues I want to give you more fun games! Today I have a fun crossword puzzle I had custom made. I'm very interested to see if people are able to solve the entire thing. You can play here, download the puzzle or play online. DOWNLOAD HERE PLAY ONLINE HERE. TWITTER My O . . . It's Romance Week and I have some fun things planned! Starting with this fun Torpedo Ink Word Search Game! You can play it here or link over play online! PLAY ONLINE You can also download it to play! DOWNLOAD PUZZLE TWITTER My Official Website Christine Feehan Website Christine's . . .
Like all good heroes and heroines it's important to know they have a code and that they stick by it. Torpedo Ink's members certainly have a code and I wanted to look at that code and how they use that to extract justice. All of the Torpedo Ink books are paranormal romance. Each book has had an ele . . . Growing up in cruelty and abuse as children, the men and women of Torpedo Ink learned more than how to seduce and kill. They learned that they could do more than survive. They could create their own family, with each other, and from that love and loyalty became ingrained in them. In Bound Together . . . I've always loved music and it's inspired me in so many ways throughout my life. I've often heard songs that cause me to think about a character or scene in one of my books. Sometimes I'll hear music that inspires a scene I'm writing at that moment. Music and emotion go hand in hand, in my opinion . . . I wanted to get across that the MC is a cohesive group and I dreamed of having several Harleys taking off or coming in, driving down the road or lined up with riders straddling them. I love motorcycles and I knew I had to have that as part of the book trailers starting with Vengeance Road. So, we pu . . . The MC Game Celebrating Vengeance Road! We've started the party and you're invited! Vengeance Road will be released January 29th and we're already celebrating! Today I've got something fun for you! It's a game where you find out about your own motorcycle club! Be sure to share in the comments so I can see your club name and what the club . . . The roar of the Harleys could be heard long before they turned off of Highway 1 toward the farm where the president of Torpedo Ink resided with his wife Blythe and his four children. Czar had put a call out for the club members to come. When he called, they answered, and they did so quickly, without . . .
Drake Sisters, Sisters of the Heart/Sea Haven and Torpedo Ink All of the books are written to be stand alone books, but a series is meant to offer a fuller experience, often with an additional story arc that ties them all together. It also allows a reader to become familiar with, not only charact . . .
Judgment Road hero Reaper has a dark and horrible past. He was taken by criminals who murdered his parents and both he and his brother Savage were put into a "school" that taught them to be assassins, and where they were brutally abused in every way imaginable. Reaper was very young when he wa . . . I wanted to talk about the differences between the series set in or around Sea Haven. The Drake Sisters and the Sisters of the Heart are about family, sisters, a sisterhood. The women these stories are about are magical, compassionate, empathetic, loving, funny women. Even with the challenges man . . .
Today is the release day for Judgment Road! There are several blogs, interviews and information out there and I thought I would put as much as I can into on place- Here! THE BOOK Judgment Road landing page on my website- ChristineFeehan.com Entire First Chapter - Here Judgment Road Book . . . If you read Bound Together you'll recognize many of these names. They're members, or prospects, of Torpedo Ink. Most of the actual MC members have their legal names and then their club names or nicknames. For those who hold a position in the club I've included that as well. Viktor Prakensk . . . I thought it would be fun to share what the different parts of the Torpedo Ink colors mean. The meaning of the Cypress Tree, on the back of the Torpedo Ink Sea Haven/ Caspar Jackets: The Cypress Tree spread out with seventeen branches. Roots tangled at the bottom with piles of skulls buried . . . It's exciting and nerve-wracking and fun all at once when an author releases a new series. Especially if you have a series or two that's already popular. You wonder if readers will give the new series a try. Will that like it? I enjoyed writing Judgment Road so much and sometimes next week will sta . . .
Berkley Bookmas, My Christmas Tree and A Giveaway! My publisher is doing something they call Berkley Bookmas and I participated by sending pictures of my Christmas tree and answering a few holiday questions. It was really fun! Several blogs are running the article about my holiday traditions and you can participate in the $100 giveaway here- Berkle . . . Thank you to all of my readers! Vengeance Road was #1 on Publisher's Weekly, #3 on USA Today and #2 on the New York Times! Next is Ice's book entitled Vendetta Road! In preparation for the January 2019 release of Vengeance Road we're gearing up with a lot of fun goodies. The book trailer is up in the community already! My team created a fun game to play in January over on Goodreads that tells you the name of your MC and what they do. Recorded Books is sending a couple of audio snippets from the Vengeance Road audiobook that I'll be sharing. We have some behind the scenes photos and blog from the Vengeance Road book trailer production. I put together a short playlist for the book that will be on my Goodreads blog. Lots going on! Christine has just written a short Christmas story as a fun, special gift for her readers! The story was inspired by Vengeance Road, her upcoming Torpedo Ink book. The story is in her online community here. Not a member of her community yet? It's free, and you can join here. Vengeance Road will be out in January and USA Today has an excerpt from it to share! USA Today Vengeance Road excerpt! 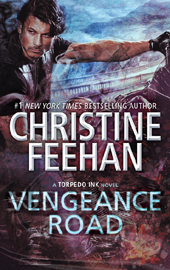 Check out the new cover for Vengeance Road! There's some controversy in my new book, Judgment Road, and I wanted to talk about that in this blog post over on Goodreads: A Controversial Strength. Judgment Road made it to #1 on the New York Times bestseller list! It did so well on so many prestigious lists and I want to thank all of my readers for their support.